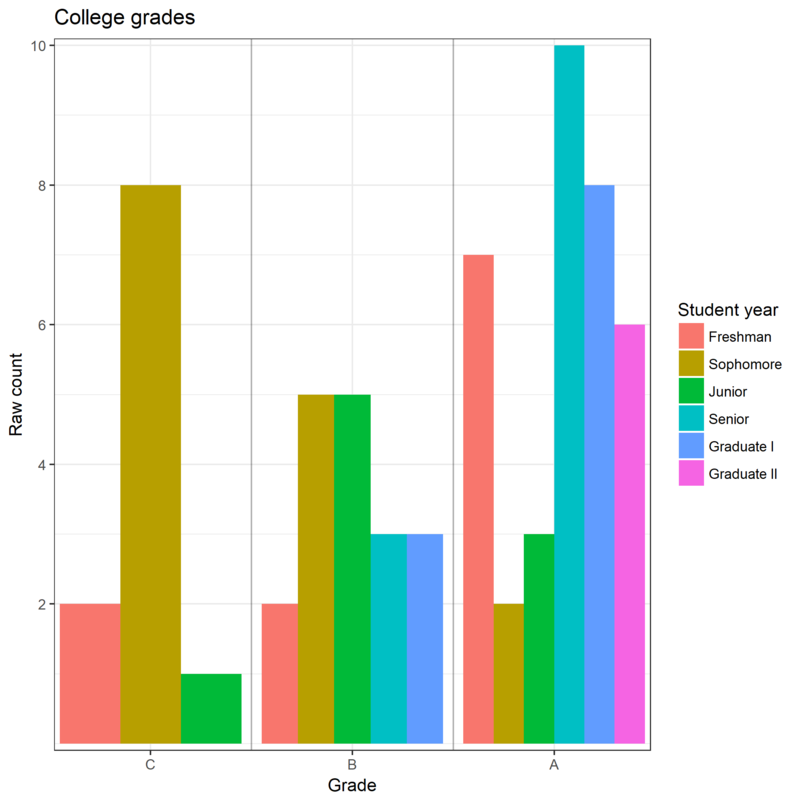 depression, school, and life : exploratory data analysis with personal data – scurrilous rag. A year into my degree, my mom had been diagnosed with ALS. An English major at the time, I was just dipping toes into the upper-level literature classes when it happened — and everything got really fucked up from there in ways too complex to cover briefly in a post about data visualization. From 2008 to 2010, I coasted through classes, changed majors multiple times, took on the classic “Cs get degrees” mentality all while not really wanting a degree in anything in particular — or really even wanting to do anything in particular. There’s a scene in the 2016 documentary Gleason, about the eponymous athlete who was diagnosed with ALS, that really stuck out to me, that had me, someone used to hiding my emotions from absolutely everyone at every moment, sobbing uncontrollably so hard we had to pause the movie: Steve and Michel are lying in bed, the only sound is the oxygen machine keeping Steve alive, and Steve starts asking with that robotic voice if Michel hates him. My parents and siblings, taken Oct. 2008 not long after my mom’s diagnosis. For two years, this conversation was every day for me and my family. Oh, that’s not that say we had this conversation every day (though we certainly had it many times), but we went through every day knowing we were behaving as Michel was behaving, and knowing the question would eventually, painfully, and slowly come around once again: We lived in dread and shame. If it’s not already obvious, I’m not comfortable talking about it, and would rather move on now to the data exercises. I apologize in advance for the glaring tonal shift. I work with a lot of data these days. As I’m pretty new to being comfortable with data analysis, I’m always hunting for small, personal projects to add to my experiences. 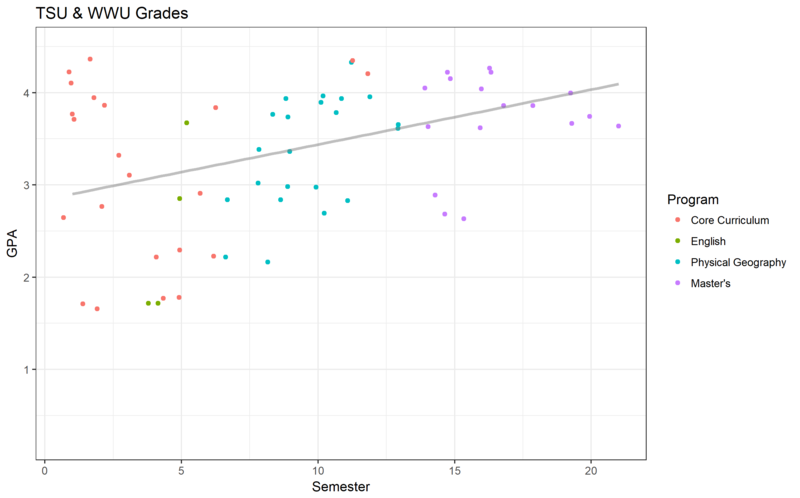 Having recently ordered my college transcripts — also knowing and understanding my academic performance took a tremendous hit from 2008 to 2010 — I realized I had an easy, small dataset to explore with data visualization. Did my performance change over time? Does the season tend to affect my grades? 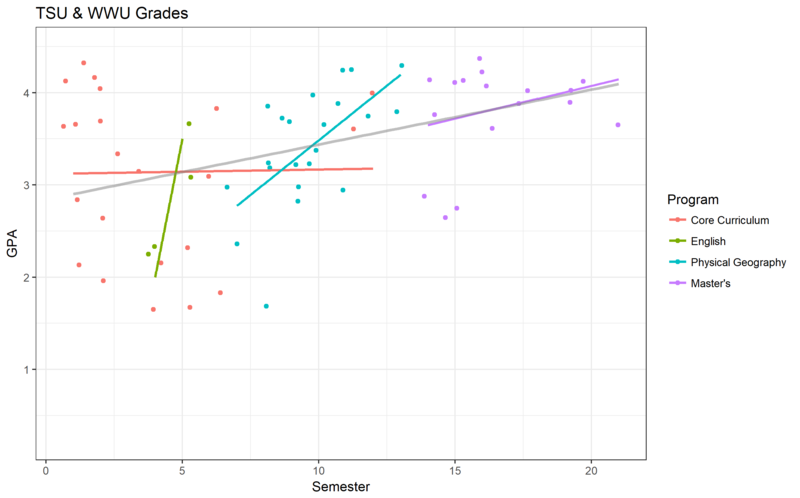 Does the course complexity — i.e., the first number of the courseID variable — relate to my grades? Does the program I was pursuing — Core Curriculum, English, Geography, Geology, and Master's Geography — affect anything? Before I get too far, there are some behind-the-scenes tidying I’ve done to this dataset — like removing Ws, substituting Ss for As, &c.
It’s still a little hard to read, but we can see a definite pattern nestled in those A​s re: Sophomore and Junior years. 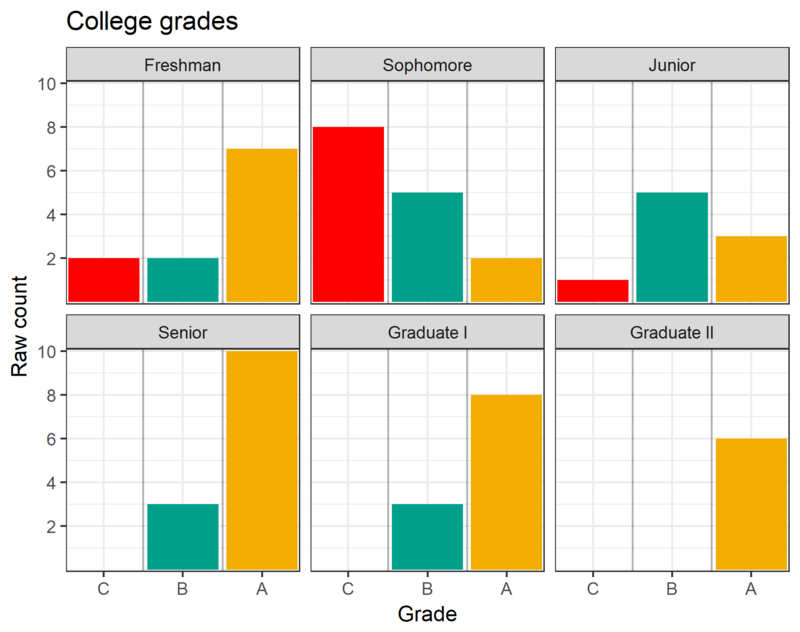 Faceting by studentYear is another option, but I rather like viewing the proportional relationship, which we get by simply adding position = "fill" to the geom_bar() piece of ggplot2 code. The precipitous drop in grades while I helped take care of my mom are unmistakable here, as well as the slow return. This isn’t a dataset that I can take beyond EDA without making in any meaningful way: It’s too small, missing too many possible explanatory variables. However, inching towards that with some basic scatterplots is another way to visualize underlying temporal patterns: A simple linear relationship shows a steady increase in grades over time, but, showing the linear relationships of each individual program I took part in shows a series of clashing patterns. I’ve about hit a wall in the type of data exploration I’m interested in. Offscreen, I’ve tried a few more combinations such as the influence of season, but the effects were not strong enough to warrant including here. I haven’t explored personal data much before, but it’s been fun revisiting school memories — even if the whole purpose of this post is using a proxy measurement for the effect of prolonged stress and depression on a life.